In April 2017 the community voted to repair the 2023 foundation and brick facade. The community garage had significant and visible foundation issues on the West and North side. Inside the large garage the floor sloped downward in the Northwest corner where the foundation slab had dropped 4.1 inches (see diagram). 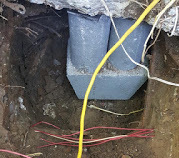 The foundation repair was invasive, especially on the West side of the garage. The shrubs did not survive, and the interior drywall was damaged. Repairs to the foundation, landscape and interior drywall were completed.